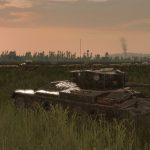 Steel Division: Normandy 44 is celebrating its first anniversary. Last week, we went to the root of the game development and looked at everything Eugen Systems added to support it. Now, we will focus on key members of the community. This article is the first one of three community-driven articles and will feature the tournament’s organizers. Hello, I am a 19-year-old German living the expat life in Hong Kong, working in sales. I have played a lot of historical games in my life, my first self-owned game was Mount and Blade: Warband, and when I turned 14 I fell in love with Starcraft 2 and the RTS genre. 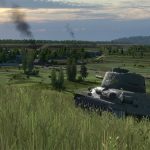 When I saw the announcement for Steel Division: Normandy 44 I instantly put it on my wishlist and got together with 2 friends on the first day of open beta. Hello, I’m Chickendew a computing student from Britain. I’ve been hooked on the strategy genre ever since my brother introduced me to AOE. Despite my interest in strategy games the only RTS games I have ever played other than Steel Division: Normandy 44 belong to the AOE series. 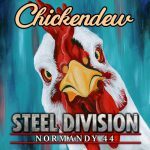 My favorite games are Steel Division: Normandy 44 (of course), Stellaris, and Eu4. Hi, I’m Curbs, a 26-year-old Welshman. I live right in-between Cardiff and Swansea in a town brilliantly named Bridgend. My town’s claim to WW2 fame would be the old POW camp we had called island Farm; in 1945 it held senior German officers, two of the most notable would be Field Marshal Gerd von Rundstedt and Field Marshal Erich von Manstein. I’m currently employed in the retail industry. I’ve got 531 hours in Steel Division: Normandy 44 although I have played Eugen games from the times of R.U.S.E. right through to Wargame: Red Dragon. As most of us here I love all things WW2 although I dabble in 40k PC games and lore as well as anything Paradox. Hello there, I am Scoutspirit a 22 years old French civil engineering student. Currently, I spend 80% of my gaming time on Steel Division: Normandy 44 or doing SD44 related activities. I am a big fan of strategy games but only discovered the « wargame RTS » type with the release of SD44. Being somewhat of a history buff I really got hooked on the historical aspect of the game. Fun fact: Being also a running enthusiast I could outrun a Panzer 730C on a 10K event. When did you start organizing tournaments? Protosszocker: I saw a lot of competitive potential in this game but couldn’t find any tournaments. So, I decided to take it into my own hands and started to communicate with Eugen, Paradox, and some of the old Wargame Community Leaders. This way I organized my first 1v1 tournament during the open beta, which was a hell of a mess and runs solely on good faith and the power of Google Sheets. Already the second one got organized through Challonge and with the 3rd one, I even had a prize pool of over 100USD. With the game release, the tournaments got even bigger, but with this also even a bigger mess, and after running into some time-consuming things in real life, I had to stop organizing tournaments. To stop being it such a mess and a night consuming event, I decided when I came back in December 2017 to focus on the Asia Pacific region only which by now is most likely the thing I am most known for in the community. It is by now going into its 6th Edition. At some point, I saw all the other community members having their own small problems and the same issues l had with organizing. 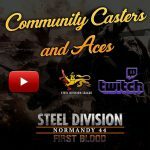 I decided while organizing the Steel Division League season 1 to get into contact with them and make this whole thing 1 step more organized. 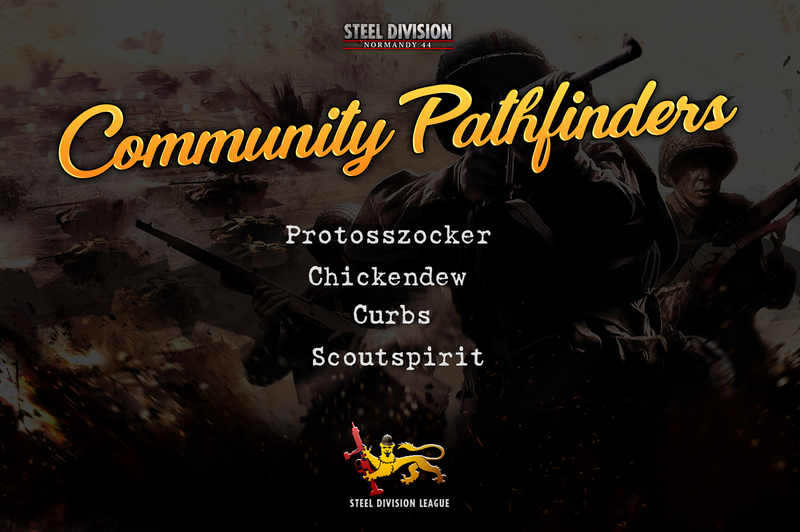 This way I met up with Scoutspirit, Curbs, and Chickendew and we decided to create the glorious Steel Division League. Chickendew: I started organizing tournaments soon after I participated in the Grand Paradox Tourney in autumn. I wanted to play in another one but didn’t find any that were compatible with my time zone. At the time the only other tournament running was the Asia Pacific Tournament by Protosszocker, and in wintertime that required me playing at 8 am. 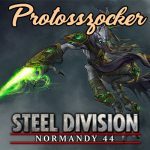 Soon after hosting the 1st European Tournament Protosszocker formed the Steel Division League, which I was invited to. The League has allowed us to work to our strengths and work together to administrate tournaments efficiently and around the clock. 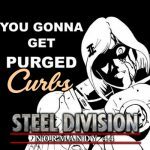 Curbs: I started to help with the organization for tournaments shortly after I signed up for Steel League season 1 about 4 months ago, I saw a post from Protosszocker asking for help on Reddit. At the time I was thinking of ways to grow the community, so I jumped at the chance. Scoutspirit: I started organizing tournaments in March 2018. At the time I really wanted one that focused on teamplay and thinking of a strategy in advance. 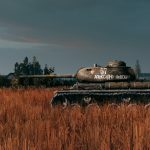 Soon after, Protosszocker invited me to join the Steel Division League to continue developing the game’s community and events. All: Together we finally got a structure into the whole system with scheduling each other tournaments and getting a full fleshed out space for the community with the Discord and the Steam Group and most importantly it is more fun in a group with such awesome guys. With this foundation, we could intensify our cooperation with the Content creators and Paradox and Eugen up to the point where we get sponsored Prizes by Paradox Interactive and streamed our League Final on the official PDX Twitch with VulcanHDGaming as a caster. Apart from answering all the questions we get from the players, we consider that the pure organization takes between 15 and 30 minutes daily on average. But with experience, it becomes easier, and the skills you develop through organizing tournaments can turn out to be useful IRL. 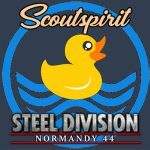 How many players are interested in joining/following competitive Steel Division: Normandy 44 tournaments? 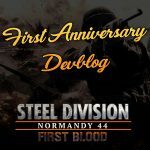 All: At the time of this blog, there are more than 400 members on our Steel Division League Discord server. It grew massively in the past 4 months, but it can still grow much bigger. In season 1 of the Steel League there were 24 players, for Season 2 there are 66, the League is now split geographically to help time zone issues and skill wise to encourage newer players who worry about being crushed. This is something we want to enhance even more in the future so that competitive play is available and fun for everyone. Scoutspirit is currently developing a ranking system from inside the League to allow the player’s skill repartition while also deepening their involvement in the community. He’s also the one who created the Steel Division League’s logo. We also got a lot of feedback from people just following and watching our tournaments, who are happy to learn from it or just watch it for the entertainment. We see casts of our tournaments on YouTube reaching 3.4K views which is a considerable number. With everything you gathered on Discord and Steam, do you feel close to the other members of the community? Protosszocker: For sure! When I first created tournaments, I was just the guy organizing tournaments, and the discord wasn’t used outside of the competitions, by now we are a real community talking about balance, sports, and other games. Also, I got closer to the Content creators and modders. It is the best gaming community I have ever been in, and the coolest thing is it is growing daily thanks to people of all regions of the world, of all skill levels, gathered to play with each other. I think the most fun ways to experience SD for players on every level is to play it with 2 fair teams in a 3v3 or 4v4 with both teams sitting in the same voice channel. You can be talking about fun things, or playing a super competitive 1v1 against players of the same skill level and both things is what our Community offers. Curbs: Each game you play you get to know them all that little bit better, which ones love to troll you, which ones like to win, and which ones are just there to have a good game and a bit of fun. For me, joining this community has increased my enjoyment of Steel Division a thousand times. I think this is because it’s gone from a game where I strove to beat every opponent I could to a game where I have fun with the people I’m playing with. So, to answer the question, each game you start with a new name in the discord, it’s another friend I end up making. 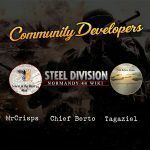 As you can see, Steel Division: Normandy 44 and its League are in safe hands, be sure to check their announcements and join their Discord if you want to participate in the upcoming tournaments! The next community-driven blog will be released in two days and will feature three Community Creators that are behind mods and the Wiki. Stay tuned!